to give the other members. We suggested coasters with their logo and he thought that would be neat. Each logo was incised/carved into the clay by hand. We were commissioned by a local agronomy business to create mugs with her companies logo (hand carved into the side). The mugs were given as Christmas gifts to her clients. to go in their Arizona home. We talked and discussed options and this is the finished product. The top band shows a design incised/carved into the clay and the lighter color is raw clay. This handmade coil vase has been hand built by stacking many coils together and then altered. This napkin holder was made with a hand carved monogram on one side. 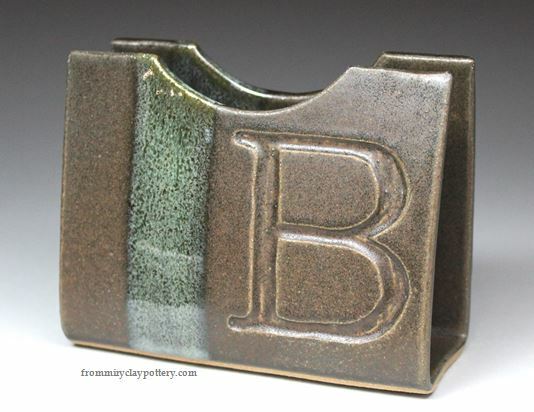 This particular Napkin Holder is also custom glazed. The glaze color shown above, is not one of our standard colors. and also for an anniversary gift! We create this vase on the potter's wheel and then hand inscribe the desired characters into the clay with a small tool. All of our tiles are handmade. The large letters we hand carved with a tool and the smaller letters we used stamps. The tile is the raw clay which has no glaze on it. The characters will be glazed. The tile can also be made without leather rope and the two holes at the top. A wire will be glued on the back for easy hanging. What glaze colors can you order? All of our tiles are handmade and the smaller letters we used stamps.